AM/FM Tuner Lets you choose from the wide range of radio talk shows and music programming and the LED Tuning Indicator helps provide precise station tuning even in dim light. With the built-in Telescopic Antenna and built-in ferrite bar antenna you will get exceptionally Clear Reception from any FM & AM stations. Built-In Speaker gives you great sound quality & convenient listening. Earphone Jack & Headphones gives you private listening enjoyment and improved sound clarity in any environment. Compact & Lightweight Pocket Size Design take it along anywhere, it fits easily into your shirt, pants or jacket pocket or keep it in your handbag, fanny pack or armband for convenience & portability. Carry Strap Lets you carry the radio around hanging on your wrist or any other comfortable way. Battery Powered keeps this completely portable and has a low power consumption and a long battery life of approximately 45 hours. 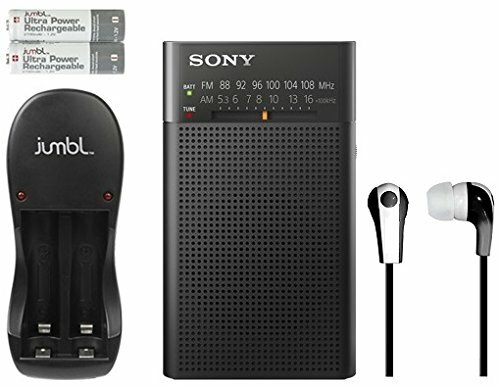 With the included batteries and earphones, you are ready to use this radio as soon as you receive it and enjoy your favorite programming right away. Ultra-Compact and Lightweight Pocket Size Design with a wrist style carry strap you can take it along anywhere. Fits easily into your shirt, pants or jacket pocket, or keep it in your handbag, fanny pack or armband for convenience and easy portability. AM/FM Tuner Lets you choose from the wide range of radio talk shows and music programming, and the LED Tuning Indicator helps provide precise station tuning even in dim light. With the built-in Telescopic and Ferrite Bar Antenna you will get exceptionally Clear Reception from any FM or AM stations. Included Jumbl NiMH Ultra Power Battery Charger with Included 4 AA Ni-MH Batteries keeps you powered all the time with 2 Batteries in the radio and 2 in the charger. Plus Included In Ear Stereo Headphone lets you enjoy listening in comfort.